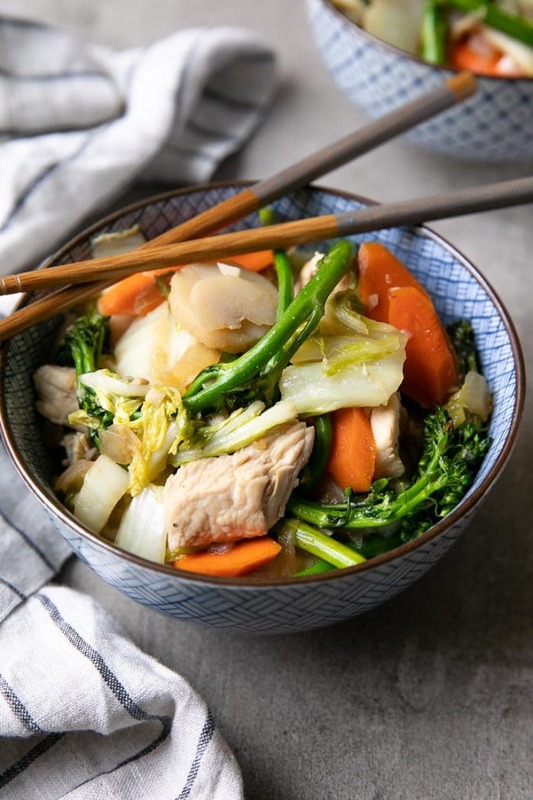 Filled with lean chunks of tender chicken, carrots, broccoli, and cabbage, this Low Carb Chicken Cabbage Stir Fry Recipe is a quick and easy one-pot meal everyone will love! 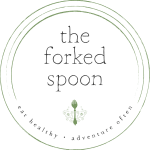 Ready in under 30 minutes, this delicious recipe is easily modified to be whole30, paleo, and gluten-free! Stir-frys, when prepared with smart and nutritious ingredients, have the potential to be incredibly healthy. Always quick, easy, and delicious, stir-frys are some of my favorite last-minute weeknight dinners. Filled with yummy protein and colorful veggies, stir-frys are great for anyone trying to eat fewer carbs, or simply eat more vegetables. 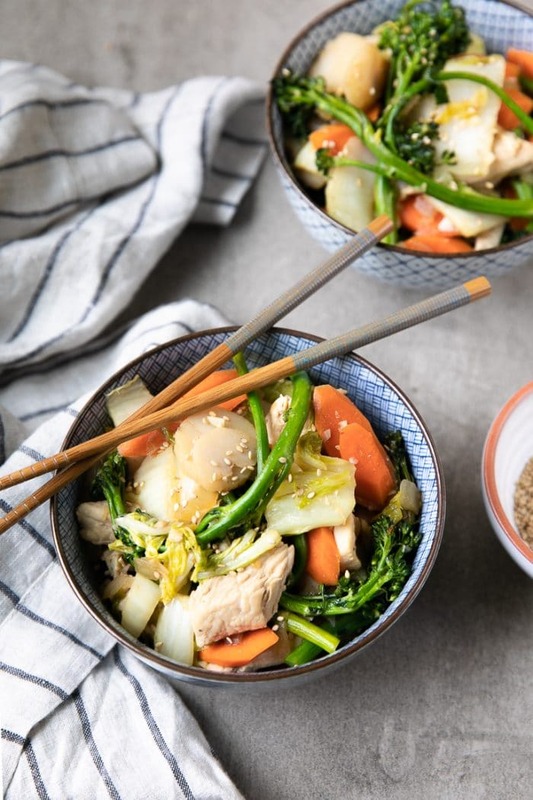 This Chicken Cabbage Stir Fry, filled with juicy chicken breast, vegetables, and a light stir-fry sauce fills all those requirements…and more! This naturally low-carb, dairy-free, one-pot dinner is easily modified to be entirely gluten-free, paleo, and whole-30. Ready in less than 30 minutes, even my 5-year-old finished his entire bowl! 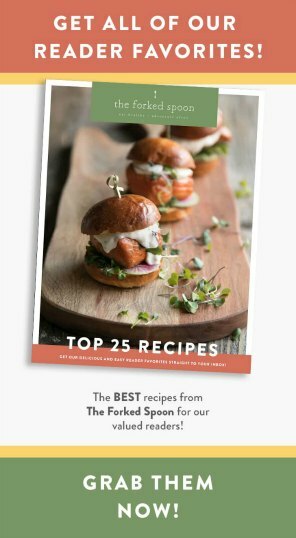 A huge fan of one-pan dinners like this American Goulash Recipe, Easy Shrimp and Asparagus Stir Fry, and Easy Skillet Chicken Marsala with Pancetta, I can’t imagine my weeks without these sanity-savers. Many stir-frys are deceiving in that they are filled with healthy chicken and veggies, but they’re covered in syrupy, sugar-filled sauce. 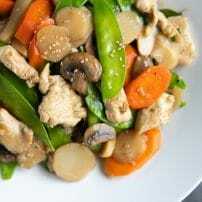 Now, I am all for a sweet chicken stir-fry every so often, but I prefer not to make it the norm- especially for my kiddo who already goes bonkers for anything and everything sweet. 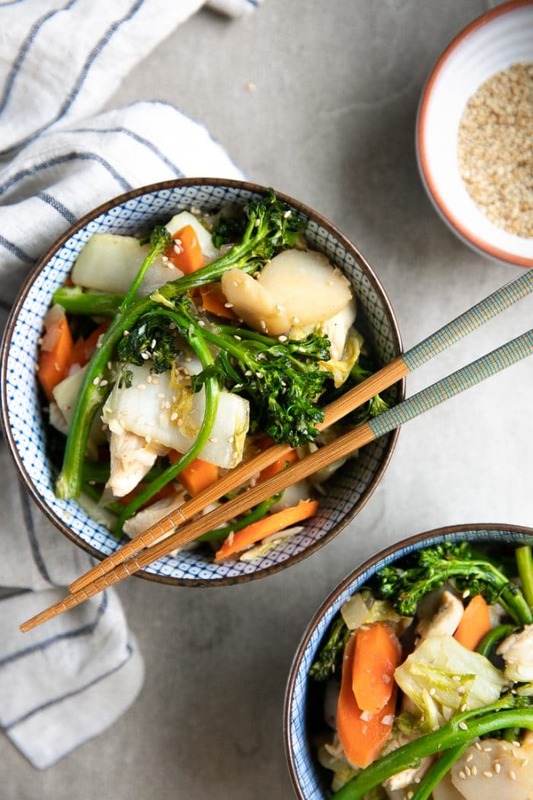 The sauce in this Chicken Cabbage Stir Fry is light, flavorful, and easy to adjust to suit your own personal preferences. Soy Sauce– This is a must-have for nearly all stir-fry recipes. It adds that familiar salty, umami flavor we all love so much from Asian-inspired dishes. If you’re watching your sodium intake, be sure to purchase low-sodium soy sauce or, if you are gluten-free, substitute with Tamari. Garlic and Ginger– Like soy sauce, it’s hard to find a good stir fry without either of these ingredients. Ginger can be a bit of a pain to mince, so I suggest using a microplane grater. Lime juice– Fresh and acidic, lime juice adds a bit of punch. Take care not to add too much, though, as lime can easily overwhelm the other flavors. Fish Sauce– fish sauce is one of those crucial flavor elements that I find myself adding to nearly all Asian-inspired recipes. It is somewhat smelly, and does not taste very good alone, but mixed with the garlic, ginger, and soy sauce, it makes for a beautifully flavored sauce. Honey– ok, guys. When I say that I added honey, I think I added about 2 tablespoons total. That is not enough to make the sauce sweet, however, it is enough to help balance the other flavors. Do you need to add honey? No. Sriracha– finally! some heat! You guys, I’m a huge fan of spicy foods. The 1 tablespoon I recommend doesn’t even come close to making this recipe spicy. However, if you are super sensitive to anything spicy, start small and go from there. 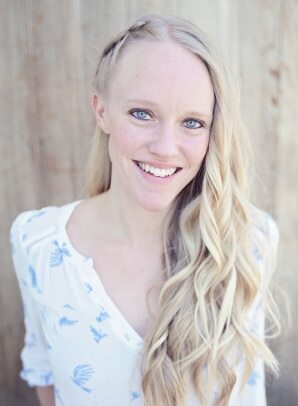 Or, scroll down to watch the video! Saute the chicken first. I always like to sauté my chicken before I get the veggies going. This allows the chicken to brown a bit on the outside which is a super easy way to add extra flavor to the overall dish. You only need to sauté the chicken for 6-7 minutes before removing it from the pot to a clean plate. Sauté the veggies. Add the onions to the same pot. In this case, I chopped my onion into small bits, but feel free to slice or cut your onion however you prefer. I always cook my onion for several minutes first before adding any other vegetable. Onions are probably the most amazing flavor contributors to anything you cook, only getting better the longer they cook. Once the onions are soft and translucent, you’ll want to add the remaining vegetables and the soy sauce. Start adding sauce ingredients. Next, you’re going to add the garlic and ginger. Here’s the thing though- you want to add these things to a small corner of the pot, ideally where some soy sauce has collected to prevent either from burning. Stir to combine with the soy sauce and then mix with the remaining vegetables. Add all of the remaining ingredients and stir stir stir (it is a stir-fry, after all). Cook for an additional 4-5 minutes, stirring often. 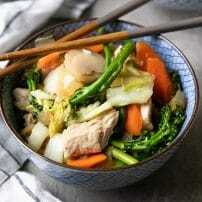 If you try making this Chicken Cabbage Stir Fry Recipe, please leave me a comment and let me know! I always love to hear your thoughts. 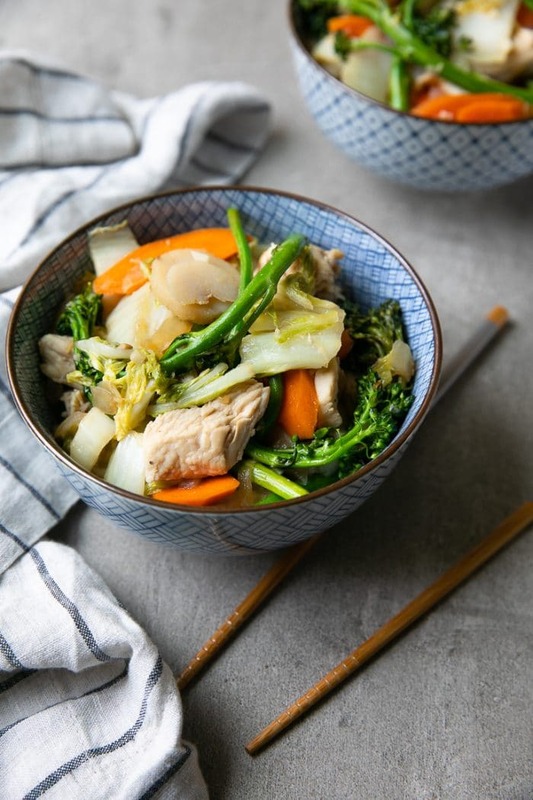 Filled with lean chunks of tender chicken, carrots, broccoli, and cabbage, this Low Carb Chicken Cabbage Stir Fry Recipe is a quick and easy one-pot meal everyone will love! Heat 1 tablespoon of olive oil in a large Dutch oven over medium-high heat. Once hot, add the chicken to the pan and sprinkle with salt and pepper. Allow chicken to cook for 6-7 minutes, stirring as needed to cook all sides of the chicken. Transfer chicken to a clean bowl and set aside. Return the pot back to medium-high heat. Add the remaining tablespoon of olive oil and chopped onion to the pot. Mix well to combine. Sauté for 4-5 minutes, or until onions start to soften and turn translucent. Stir in the carrots, cabbage, soy sauce, and broccolini. Mix well and allow to cook for 3-4 minutes, stirring often. Add the garlic and ginger to one corner of the pot and mix to combine with the onions and soy sauce before mixing to combine with the remaining vegetables. Add the lime juice, fish sauce (not shown in the video), water chestnuts, honey, and Sriracha. Mix thoroughly to combine. 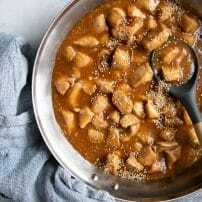 Continue to cooking for 4-6 minutes, stirring often, or until vegetables are tender and chicken is heated through. For gluten-free option substitute the soy sauce with tamari. To make this whole30 and paleo approved, omit the honey. 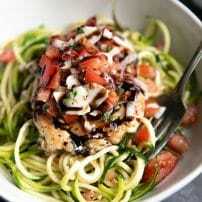 I love this because it’s an easy recipe to make and it looks delicious! thank you! Your welcome Bryan – enjoy!